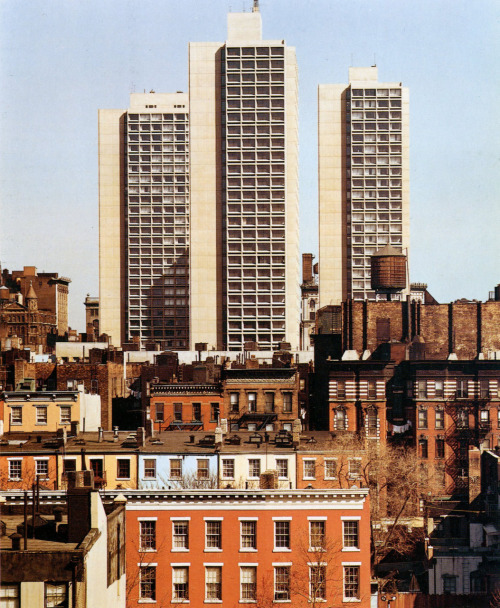 One of the lingering concerns over the NYU rezoning of its two superblocks—besides whether it not it was The Final Nail in the Village’s coffin—was the fate of 505 LaGuardia Place, one of the three 30-story concrete sentinels that makes up the I.M. Pei-designed Silver Towers. The other two are faculty apartments, but this one is Mitchell Llama public housing, and the lease with NYU was set to expire in 2014, at which point rents could jump to market rates, possibly driving out long-time residents, many of them elderly. According to local Councilwoman Margaret Chin’s office, NYU has agreed to provide 505 LaGuardia with the old lease agreement in perpetuity. The pols who fought for this agreement, along with the tenants benefiting from it, are naturally ecstatic, as made clear in their quotes below. “I applaud Councilmember Chin for negotiating this commitment,” New York State Senator Thomas Duane said. “I have long held that NYU must help preserve 505 LaGuardia Place as affordable housing both for the current residents and future generations because of the significant contributions that economic diversity has made to the fabric of the Village and New York City as a whole. I appreciate the University’s decision to ensure that future lease terms with the cooperative, a state-sponsored Mitchell-Lama development, are such that affordability may be preserved.